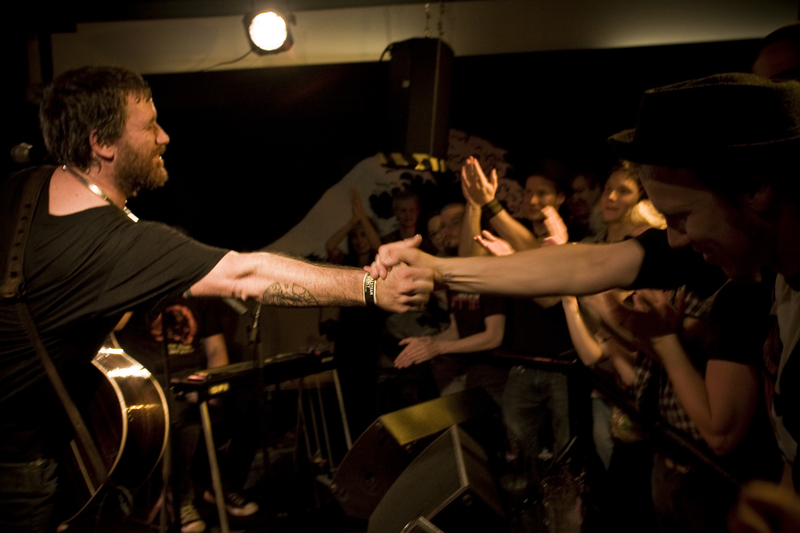 I caught Chuck Ragan at Ilves restaurant in Helsinki, Finland a couple of weeks ago. It was the last night of his European tour and he insisted on paying for the beers. We talked for about forty-five minutes about his new solo work and how maintaining the freedom he loves meant slowing down (not breaking up) Hotwater Music. Its horribly cliche to say, but Ragan is truly a “nice guy.” Not that he’s messily polite or anything like that; he’s just an enjoyable person to speak with. It is something that immediately strikes you when you meet him. Consider what makes him this way and you realize he’s speaking from somewhere right in front of him. He’s honest. That’s transmitted into his music. After our interview he played to a sold out show of Fins, who somehow knew his lyrics even though Finland is awfully far from Florida. NadaMucho.com: So how has the tour been going? 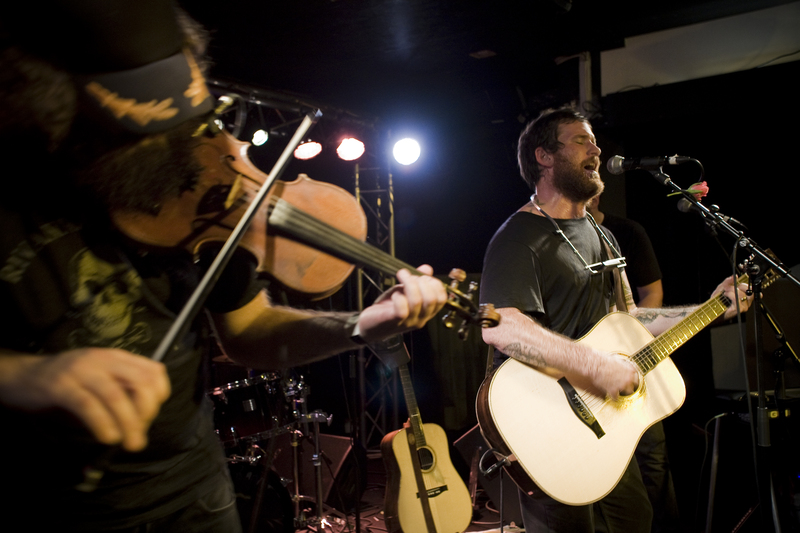 Chuck Ragan: It’s been incredible. A month long and I think a total of around 26 shows… 27 show including a couple of in-stores and a wedding. NM: A wedding? Where was the wedding? CR: In a tiny little town outside of Leipzig. It was just a friend of ours, of Tom Schindler our tour manager’s who was driving us. He had a friend who was getting married. We just pulled in the day we were playing Leipzig. It was in this beautiful little castle tucked into this tiny town. We played some songs for the whole wedding party. For all the parents and the kids. It was amazing. NM: That’s great. So that’s a stand out part of the tour? A little boy came up to me when we were finished. He was probably 5 years old or so and he had a little 1 cent euro coin and he held it up and said, ‘please please…’And I took it and that was our payment for the day and it was amazing man. It is things like that that we live for. NM: Are you finding a lot of people knowing your music? Are they singing a long? CR: Yeah, last night we played a festival and Jyvaskyla and I was dumbfounded. I was amazed. I’d never been up here. Hotwater has never been up here. There was just a massive amount of people that knew the songs… that knew the lyrics… that were clapping along and singing and dancing. I had no idea that it would be like that. Whenever you go to a city… or country for that matter… where you’ve never been… you don’t know what to expect. And that’s a good attitude to have. Because if there had been twenty people there we would have been just as fired up and played just as hard and had just as much fun. But there was a huge turn out and just tons of fun. NM: People have compared you to Dylan and Springsteen. You’re singing about freedom and you do what you do and you give it one hundred percent. What do you think it is about the kind of music that you’re singing that brings people out? CR: I’m not entirely sure. What I do know… what I’ve learned over the years… I was lucky enough to grow up with a bunch of guys who played music for real. We played music from the heart and we still do today. That’s all we know. We never really came from a circle of trying to find a gimmick for the band or the music. Our idea… what I came to know… was that music was there for me as a kind of therapy. A way to release and express and get through. By doing that you don’t have any choice except to do it in an honest way or otherwise you’re lying to yourself and everyone around you. I think people adapt to that, can accept that, and appreciate it. I know it do. When I go to a show and I see someone giving it and putting their heart and soul out there I appreciate that and I respect that. And I’ll go back I’ll go see them. That to me is how us music lovers weed out what we like and what we dislike. What’s true or false. NM: The honesty of the musician? CR: Absolutely. Over the years I’ve definitely learned that you get what you give. If you take a stage with a bad attitude or you’re ungrateful for where you are or what your doing or your surroundings. That’s going to come back to you. There’s nothing that perturbs me more than seeing a band out on the road or an artist out the road who are not appreciative for what they have. They could be out in the middle of nowhere with everything handed to them on a silver platter…a show, a turn out…and its still not good enough for them. That to me is a downfall. That’s why I feel like folks that take a negative attitude…that’s not just with music. With any work or trade if you bring your problems or insecurities to your job or whatever you’re doing. Your art, your passion, whatever. You’re going to be given back that. It will come back around. I think it all comes down to the old simple fact of treating people how you want to be treated. NM: In your lyrics what are you singing about? I like the song about Edgar J. Watson (Bloody Shells off Bristle Ridge) How did you decide to write a song about him? CR: That song in particular was inspired by a book I read by Peter Matthiessen. The book was called Killing Mr. Watson. I lived in Florida for years. That particular story is about a fella who migrated from California out to Florida, down on the Gulf Coast side. It was just a really interesting book. A really interesting story. Really heavy duty. The whole premise of the book was basically there was rumors he had killed a person, which was why he fled the west. No one ever knows if that really was true. It was just kind of talk. When he moved down to the Gulf Coast he starting working, raising sugar cane which no one had really done before down there. Just really started enterprising and just tearing it up, becoming wealthy, powerful. And this was an area that couldn’t be more backwood. It was an area called Chokoloskee Bay. The ten thousand islands people know it as. This was mid to late 1800s. Even where there was law in Florida this area was completely lawless and the people as a community governed themselves. A lot of different things happened… basically long story short… there was a lot of things that made the community feel that he was a threat to their society and they banded together and shot him down. In front of his family. In front of his kids. I mean everything. It is a pretty heavy duty book. Peter Matthiessen wrote that book and a lot of the accounts are true accounts. This is [about] a real man Edgar J. Watson that lived down there. A lot of the stories are legends, folklore, some of them have a lot of weight to them. It was just one of those stories that really moved me and felt worth telling. NM: A lot of your other songs sound like you are some kind of journey and you are discovering some kind of revelation about yourself. Is that a fair read? CR: Yeah, like I said before, my music has always been like a therapy for me. When I’m not telling a story, passing on a story like the one you just asked about the songs are more diary entries or journals. I don’t necessary sit down and think that I need to write a song about…hmmm…you know…this or that. Most of the time it is just whatever comes out. Sometimes it only comes out as sentence and stays a sentence. Or sometimes it turns into a paragraph and thus turns into a song. I never really know. I don’t really know how it works. I have a few different formulas, but most of the time it is just writing to get it off my chest. That said… it varies… completely. In terms of things that I write about. I feel that the majority of time it comes down to a therapeutic way to get things off my chest. And by doing that I want to figure out how to be a better person. How do be a better husband, how to be a better friend. A better member of society. Its simple. Its really nothing fancy or groundbreaking. Its just telling stories and getting things off my chest I’d say. NM: Let’s also talk about fishing. Everyone knows you are an avid fisherman. Would you be a professional fisherman along with being a musician if you had the chance? CR: [laughs] Absolutely! I just haven’t figured out how to do that yet! NM: How does the fishing connect to the music? CR: Well, I mean, honestly, there’s so much more…and I feel like I could say this about so many musicians and friends I have in music…there’s so much more to all of us than what people know. People see us as this singer or this label or this band name or this artist or whatever and their experience with us is maybe an hour out of a year on a stage. That’s it. There’s so many layers to every person. Pick one thing that you love to do and if for some reason all these people knew you for only doing that one thing… For me there’s so many other things I have just as much as a passion for as playing music. I have a massive passion for music, but I also have a massive passion for wood working. Its the same thing to me. Designing and building something and then utilizing that. Aside for that, fishing to me…there is much more to it than just fish, you know? [laughs] I grew up with it. I love to eat fish. I love being as self-sufficient as I can. I love grilling my own food. I love being able to look at cycles…feeding cycles, moon cycles and find fish and stock my freezer for months. I grew up that way. There’s some kind of primal fulfillment I get from being able to source my own food without the everyday connivence we are all surrounded with. Granted, I can’t do that all the time, but to me being out in the woods or being out on the water is just a place where everything kind of dissipates. I can either think about everything or I can think about nothing. And be completely at ease, completely at peace. Focus. In the meantime, maybe slay some fish! NM: Who are you playing with nowadays? CR: Right now I got a bunch of friends with me. Jon Gaunt whose on the fiddle as been on pretty much the majority of the solo stuff I’ve done. He’s from Gainesville, Florida. I have Digger Barnes with me. He played on Bristle Ridge and Gold Country. Playing bass. Todd Beene is with us he plays peddle steel. Another buddy of ours Jake Crown playing some drums. From Florida. Its been fun. The whole goal was just kinda to put together a whole band so we could play the songs from Feast or Famine and Gold Country as closely as possible to the recordings, which I’ve never been able to do. I love playing around in the studio, adding instruments and just exploring and just finding sounds. I love playing live totally solo and it still scares me. That’s why I love it. At the same time its cool to get friends up there and play with friends for one… and also bring all these sounds back that we did on the recording that I am not able to replicate by myself. NM: How do the songs change once you go into the studio? Do you break the song down a lot or is it pretty much the same song with additional instruments? CR: It kinda varies. My whole goal now a days is whenever I’m going into the studio I want to have at least twice as many songs as are going onto the record. And then narrow it down and cut it in half. My goal is to put these songs together where they can totally stand up on their own just a vocal and a guitar. At least to me. I know that’s not for everyone. But to me if it feels right. I believe I’m at least headed in the right direction. A lot of times I’ll just lay that down, vocal and guitar. Then let the song let me know what it needs. It usually happens that way. With a couple of these guys, Todd Beene for instance, he wasn’t able to make it out to the studio so I sent him a few songs and said ‘check it out.’ I had some input on a few songs I definitely wanted steel on. The others I just said have a listen to, if something jumps out at you, do it. NM: So are you actually acting as a composer and directing each additional part? CR: Pretty much the whole time. I produced this record myself. The way I like to work, I certainly have a lot of input on what goes on my songs. When I have a group of songs… just letting the songs let me know…like a piano would be good here. Then I like to bring in my friends and direct them in the sense of… play on this. If I have input its, ‘come in here, come out there. Do this here.’ If I have a melody in mind I’ll let them know. From there I just like to turn them loose and say ‘now you do what you do.’ I give them my input as to where I want them. Then I turn them loose and let them do their art and let them be the musicians that they are. From there I capture what feels the best. NM: You seem to have this huge commitment to freedom. As far as I understand it, except for the time that you played on stage, with Hotwater Music it was becoming a routine for you? NM: You weren’t following what your motivations for starting a band were. So you stopped it? NM: Where does this total to commitment to freedom come from? What gives you the motivation and the energy to keep striving for it? CR: I mean what gives me the energy for it is the actual freedom itself. I see myself almost like an independent contract. Like a freelance worker. Right? For years…as all musicians…most musicians…I worked all kinds of job. Most of the time I would go back to my carpentry trade. That was usually an easy job to jump on the job site. If I got let go or was on tour for too long I could come back and jump on another job somewhere else. Then there came a point where we had to decide. Are we going to do music for real? As in are we going to try making a living doing it? We were in this limbo point where we were on the road so much we could not hold down a decent job. We would come back homeless. Literally with our belongings on the street. No job. No place to sleep, sleeping on couches. At the same time, the band wasn’t making enough money. We weren’t touring enough to live off of it. So it was this really hellacious place to be. We loved being on the road, but then we would come home and it was just total hell. When we finally got to this point where we were going to do this for real… and if we do it for real we were we were going to do it full force…We did that. For the next years after that we were on the road for 8-10 months out of a year. Which was really tough because we had already spent that first five years making some really serious sacrifices. We just kind of piled it on and kept going. The positive thing is that we got to this point where we would be able to pay our rent, have enough food, and float on buy until we got home from that next tour. There was no such thing as saving money, we were kinda at even keel, but the positive thing about it is that we worked for ourselves. Doing that it was a good feeling. It made it really hard to go back to any job working under the thumb of someone else. When Hotwater went on hiatus I went back to my trade, my skills in carpentry, and the last thing I wanted to do was to work for a company. Its really tough to head back to any structured environment where you are working under someone when you’re able to make a living…plan your schedule…plan around your family… plan around holidays. There’s downsides to it. There’s no guarantee where your pay check it coming from. You have to go out and get it. That’s the tough thing about being freelance or being independent. That’s the hardest thing about being DIY. Doing everything yourself. I would say, for sure, what gives me the energy to continue finding that freedom and living that freedom is I know that freedom.